Late last June Facebook began a program that allows users to be beta tester of their applications for Android. It is a way of helping the social network, since there are so many different terminals with Android and being so fragmented, it helps them find bugs much faster than if they do in the laboratory and the users allows them to test new features before others. A similar program that launches is now Twitter and we assume that also by the same problem that presents Android. Those who use the Twitter app for Android can apply for the program and if accepted they use the beta version, which will allow them to try out new features before developing other users on the other hand will help the company to provide better application. To enter the program Twitter for Android Experiment have to enter the Twitter group on Google Groups and follow the instructions. 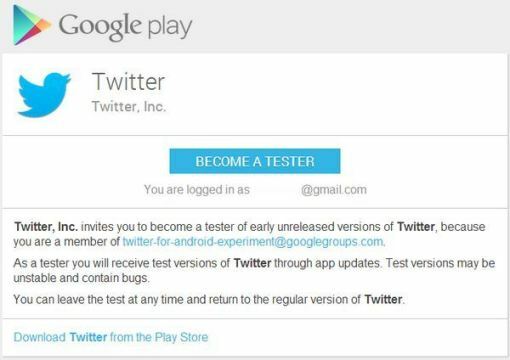 Finally, they should visit the link they give you to download the Twitter beta app from Google Play. For now it is not clear if they accept to all who want to participate or only some users. Nor it is clear whether it is for all regions of the world and in which languages is available.